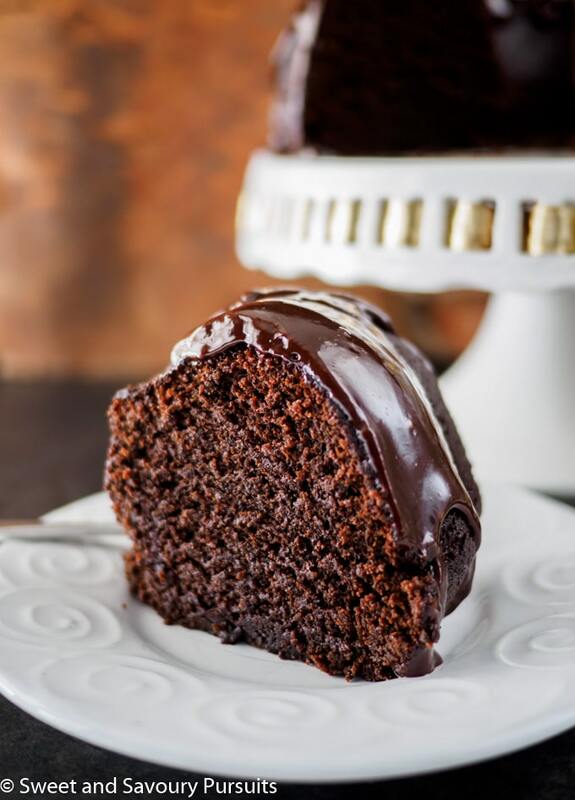 Moist, tender, rich and very chocolatey, this Chocolate Stout Bundt Cake is the perfect addition to your St-Patrick’s Day menu! If you’re looking for a special dessert to celebrate St-Patrick’s Day, and want something with some serious dark chocolate flavour then this is the cake for you! 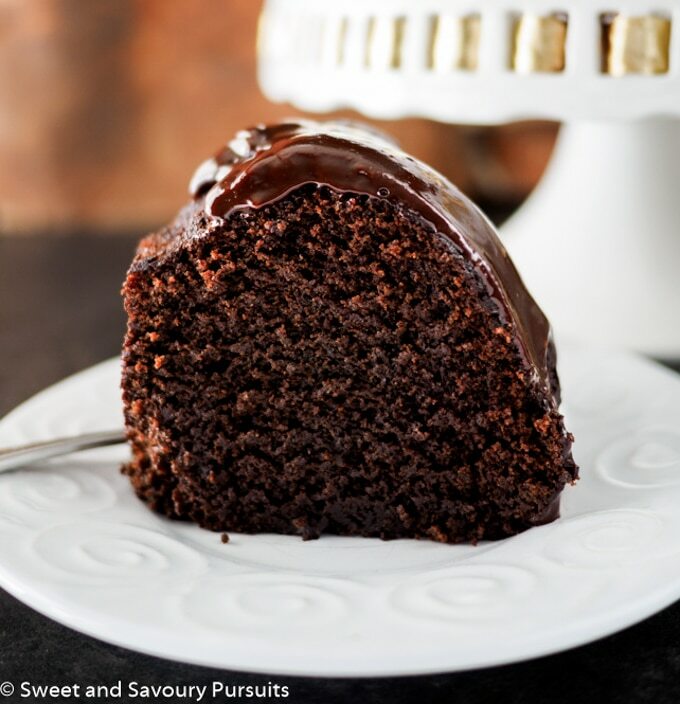 This Chocolate Stout Bundt Cake is as chocolatey as they come. You might think beer is an odd ingredient in a cake, but in fact the toasty chocolate and coffee undertones of stout (such as Guinness) make it an excellent choice for incorporating into chocolate flavoured baked goods. Though I have cooked with beer, this was my first time baking with it. Beer works as a gentle leavening agent seeing that its carbonation helps cakes, quick breads, and muffins rise high. This chocolate cake is not overly sweet and after your first couple of bites you’ll most likely detect a hint of bitterness from the stout and the dark chocolate. Topped with ganache, this stout spiked bundt becomes a decadent treat. If you make this cake, you’ll find it’s moist, rich, dense and so very chocolatey! If you have any leftovers, I recommend serving the cake slightly warmed, a few seconds in the microwave should do it. If you’re looking for more St-Patrick’s Day recipes, here’s a delicious recipe for Irish Soda Bread. Happy St-Patrick’s Day! Moist, tender, rich and very chocolatey, this Chocolate Stout Bundt Cake is the perfect addition to your St-Patrick's Day menu! Position a rack in the center of the oven and pre-heat oven to 350°F. Grease a 10 or 12 cup bundt pan and lightly dust it with sifted cocoa powder. Tap out excess cocoa. Combine the stout and molasses in a small saucepan, place over medium-high heat and bring the stout and molasses to a simmer. Take the saucepan off the heat, add the chopped chocolate, stir the mixture and reserve. Into a medium bowl, sift together the flour, cocoa powder, baking powder, baking soda, and salt. Using the paddle attachment on a stand mixer, beat the butter on medium speed until creamy and smooth, about 1 minute. Add the brown sugar and beat on medium speed until light and fluffy, about 3 minutes. Stop to scrape the sides and bottom of the bowl as needed. Beat in the eggs one at a time, stopping to scrape the bowl after each egg. With the mixer on low speed, alternate adding the flour and stout mixtures, beginning and ending with the flour. Make sure to stop the mixer to scrape the sides of the bowl and then beat at medium speed until the batter is smooth, about 30 seconds. Pour the batter into the prepared bundt pan, and run a knife through the batter to eliminate air pockets. Bake cake until a wooden skewer inserted in the center comes out with only a few crumbs, 40 to 45 minutes. Set the pan on a wire rack to cool for 20 minutes. Invert the cake onto the rack and remove the pan. Let the cake cool until it's just slightly warm. Pour the heavy cream into small saucepan and bring to a boil over high heat. Remove the saucepan from the heat and add the chopped chocolate. Let the mixture stand for 1 minute and then stir until the chocolate is melted and smooth. Let the ganache cool for 2-3 minutes. Slowly pour the warm ganache over the cake. Let cool to room temperature before serving. This cake can be made ahead, wrapped in plastic without the ganache and stored in the freezer for up to a month. I have to make a guiness chocolate cake for St Patricks day. I love a good moist chocolate cake and this looks incredibly delciious. Thanks Suzanne, I would definitely recommend you give it a try, it was really moist and stayed that way for a few days! This looks amazing! 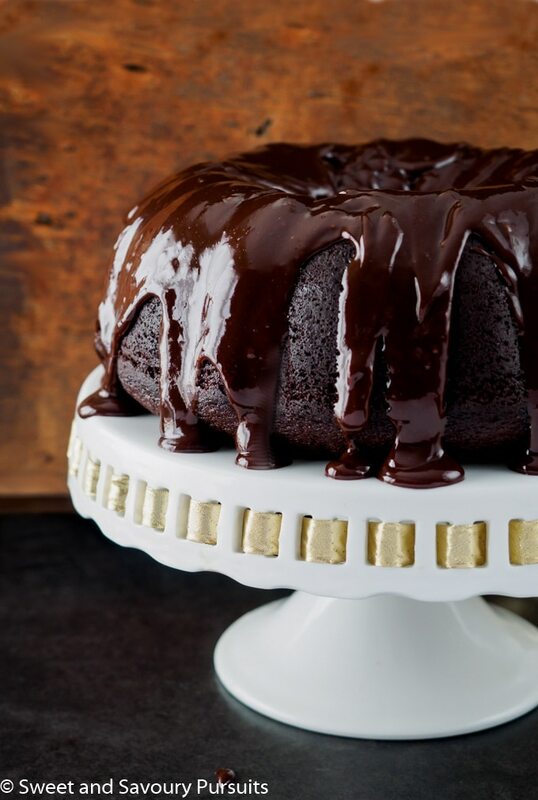 So moist and so full of chocolate. Love it! Thank you, definitely one of the most intense chocolatey cake I’ve made! With those ingredients, it has to be as delicious as it looks! Thank you Hilda, I have to say it’s hard to go wrong with all that chocolate! This cake looks incredible!! I was actually just reading a chocolate stout cake recipe from the NYTimes today. I think it’s a sign I have to make something like this too!! Oh, I’ll have to take a look at the recipe, I like to compare recipes and see how they differ, sometimes a different ingredient can really change the flavour and texture of a cake! I think I died and went to heaven. 😀 This cake is absolutely gorgeous and looks al decadent. That ganache is killing me! So so good!! Wow, that is a gorgeous Bundt cake. The addition of molasses must have made it very moist! Thanks for sharing at FF! Thank you Apsara, this is definitely a very moist cake, I think it’s a combination of the beer, molasses and brown sugar. Omg, seriously?! I have had this intense chocolate craving the past few days and I have resisted…. this may be the straw that breaks the camels back! Just look at how moist and rich that cake is!!! I need this in my life, now! This bundt looks absolutely perfect… perfect to eat all year long and not just for St Patrick’s Day! I love the combination of beer and chocolate and this cake is the perfect avenue to pair them. Thank you Nancy! I agree, this cake is too good to limit to just St-Patrick’s Day!